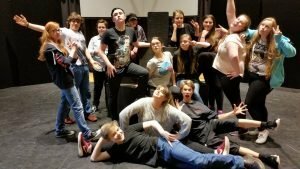 During the second week of the last October holidays, I, along with 13 other young people completed our second intensive week of the National 5 drama course at Eden Court theatre. This week was indeed named aptly, as we were all working from 9:30 in the morning till between 4:30 and 5:30 in the afternoon for 6 days, which for myself along with a few other students required a residential stay in Inverness, due to the distance that I live from the city itself. The week was one of three six-day blocks that are part of the course, each focused on a particular aspect of drama; this one being devising. Our task for the week was to create a short play, between 10 and 12 minutes long, which we were to perform at the end of the week to anyone who wanted to come along, which would act as a sort of prelim for our final scripted performance in April. We were split into groups of around 5, and given 3 stimuli to work from, a quote, a video/picture and a piece of dialogue, all vaguely themed around the concept that machines were taking over jobs that we know and work in today. At the beginning of the week we had nothing to show for ourselves except a few ideas scribbled down from our last lesson, and by the end we had a fully-fledged piece, ready to perform (or as ready as you can get within 5 and a half days) along with scripts filled with stage directions and actors notes, characters with developed personalities, movements and specialised voices, lighting, make-up, costumes and sound. We were guided though our lessons, with explanations and information on things such as the creative process, how to generate and reflect on ideas and things like that. We were also given tips on things such as stage directions, and how to properly write up a theatre script and how to note down advice on movements or characterisation. However as far as the ideas were concerned, it was entirely up to us to create something from virtually nothing. Throughout the week, we were not only required to focus on our own plays, but also to choose a production skill (make-up, lighting, costume, stage-management, sound or set-design) and utilise that skill for one of the other teams performances. For example, in my case as I had chosen make-up as my production skill, I was required to design and apply make-up on the cast of one of the other plays, as well as working with them to create make-up that would accentuate the characters and help communicate the ideas of their play. All things considered, we all put a massive amount of work into the last week and each of our groups came out with a pretty fantastic performance. Now the devised piece is over we are pretty much half-way through our course, and have gotten over the hump of potential quitting I think all of us are very much looking forward to the rest of our classes for National 5, and I at least hope to be going on to take Higher. I am personally incredibly thankful for the opportunity that this course has given me to be able to study Drama (as it is not available at this level in our school) and to do so in a professional environment that will undoubtedly build up my knowledge and experience far more that a regular school course ever could. If you’re interested in taking part in either the Nat 5 or Higher courses look out for the applications that appear around February time.